If we were to ask a middle class person, what worries him the most these days, many of them would say ‘inflation’. Only thing which is growing faster than corruption in India are prices. You do not have to cut an onion these days for it to make you cry. Just looking at its prices sends the tears rolling. चुकंयेंगे ? नहीं ! (Chukayenge? Nahi!) is a Hindi adaptation by Amitabh Srivastava of Nobel Laureate Dario Fo’s original “Can’t pay, won’t pay”/ Non Si Paga! Non Si Paga!. The original play was written during autoriduzione (self-reduction) movement, during an economic crisis in Italy, in which women (and men) would take what they wished from markets, only paying for what they could afford. In the current state of India, a lot many people would want to do that. In the play they show what would happen if they actually did so. The entire play is set in a working class man’s house. The lower middle class woman (Lakshmi) becomes a part of spontaneous uprising at the local super market and comes home with lots of household material without paying for it. She is scared that if her self-righteous husband would find out, he would not agree to it. Her reluctant neighbor (Mala) becomes a part of mayhem and more complex spontaneous situations unfold when the police come knocking. So a lady suddenly becomes 5 months pregnant, new medical miracles happen with pregnancy transplants and things really get out of control when there is a “ek policewaale ki pregnant laash” on stage. The cast, comprising of Asmita’s lead actress Shilpi Marwah (playing Lakshmi – also seen in movie Ranjhnaa as Sonam kapoor’s friend) has given some phenomenal performance. Palak Bhutani (as Mala) was very expressive with her hand gestures and facial expressions and really showed her discomfort for being put into the midst of the situation as a spontaneously pregnant woman. Rahul Khanna and Ishwak Singh had small roles but set the audience rolling with laughter with their one-liners and body language. 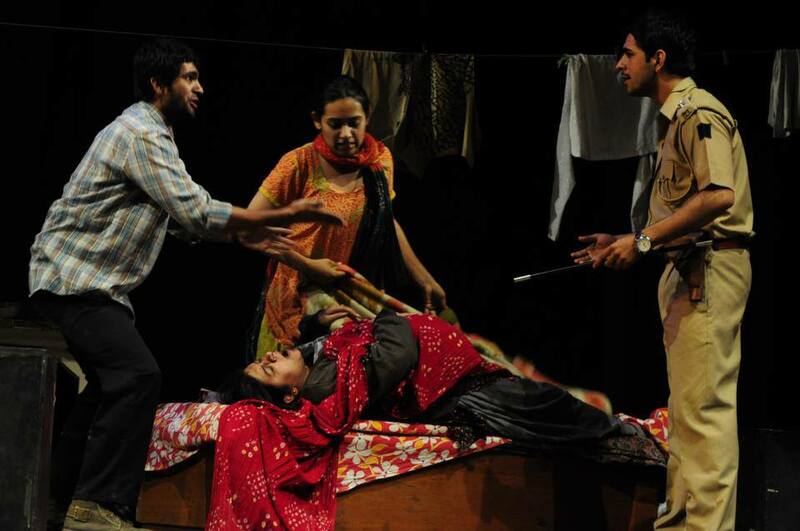 Himanshu Maggon and Gaurav Mishra depict the plight and the struggle of working class to great effect. Asmita Theatre connects the audience like very few other theatre groups. Theatre in Delhi has often been associated with aristocrats and high society people, Asmita caters to entire population - to the well read with their intellectually stimulating plays like Ambedkar vs Gandhi, to middle class through almost all their plays since they are an integral part of it and to the not so well read people like me can still enjoy a good laugh with easy to understand language without going bankrupt (due to their low ticket price).